Octagonal log home provides a unique coastal experience. Set in a wooded neighborhood the home feels like your own tree house. On cold days relax in front of the gas fireplace and play a board game. On sunny days the activities are endless. In the evenings, enjoy a drink on the large deck and listen to the wind in the pines. The open floor plan of the upstairs encourages family time. Both bedrooms are downstairs on the ground floor with the bathroom and laundry. 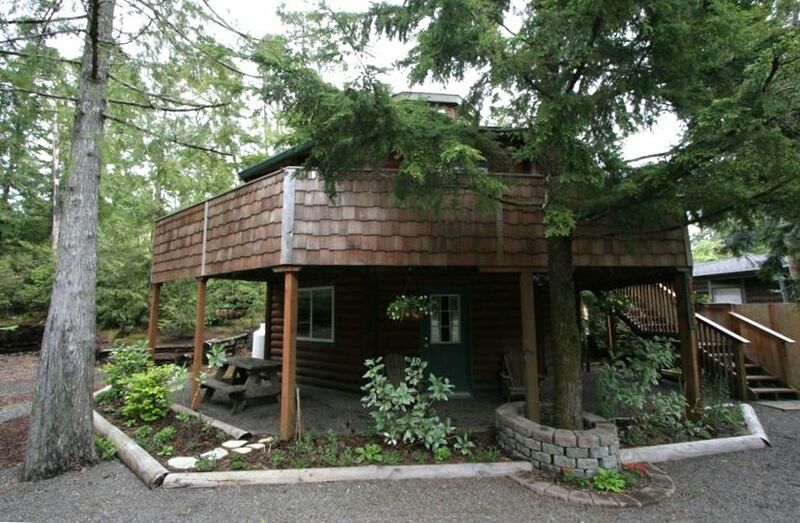 This home is located just minutes away from the incredible seven miles of Manzanita beach, Nehalem Bay State Park, and the quaint town of Manzanita and Nehalem. Enjoy kiteboarding in Manzanita, surfing at Oswald West or trail running up Neahkahnie Mountain. If relaxation is your idea of vacation you can visit the spa in Manzanita, browse antique shops, walk the beach or drink coffee at one of the local coffee shops. Like to fish? Wheeler Marina is a few minutes down the road with boats and crab pots to rent. At low tide walk along Nehalem Bay to dig for clams. We are 40 somethings who live full time in Hood River, Oregon. We are self employed and run a small video production company and run kids adventure camps in the Columbia Gorge. When we aren't working we take our daughter to the beach where we unwind, surf and eat cinnamon buns at Bread and Ocean. We feel fortunate to live and vacation in such beautiful places. While in Hood River we grow our own food, run our cars on vegetable oil and do what we can to live a simpler life. We had a dream to own a log cabin one day. When we moved to Oregon the log cabin dream turned into a tree house dream which turned into a yurt on the Oregon coast dream. We didn't plan on buying a house but when we saw our cabin we knew this was the place for us. It was a log cabin, treehouse, yurt all in one! We love the relaxed environment of the Manzanita area and prefer it to the more touristy areas on the coast. We enjoy cooking big breakfasts in the cozy main room and taking morning runs on the Alder Creek Farm trail. Other mornings we'll go to Bread and Ocean for a tasty morning treat and head to Neahkanie Mountain to see what kind of mood the ocean is in. We love day trips down to Oswald West Park where we haul our daughter, our surfboards and snacks for a day at the beach. Oswald is our favorite beach to enjoy with our family. In the evenings we enjoy a drink on the deck at the house and cuddle in front of the fire while we play games and read. We leave the cabin fully restored, rested and grateful. Electric baseboard heaters in the bedrooms and bathroom. Bathroom heater is operated through the thermostat in the master bedroom. The octagon shape of the cabin makes the living room truly unique. Gather by the fireplace to play games or share meals. We have a drip coffee maker. We have some pantry items stocked. Salt, pepper, spices, paper towels, etc. The counter seats 3 people and the table seats 3 people. The main room is open and perfect for casual eating. There is an eclectic collection of CD's. There is an eclectic collection of DVD's and CD's. Wonderful secluded deck on the second story. The cabin is two stories with the kitchen upstairs and the bedrooms downstairs. Enjoy game night with an air popcorn maker.